This is my first portfolio update post after I had finally decided how to go about doing this. Firstly, this category is catered towards the topic ‘portfolio’. This is will include the learning journey on my portfolio management, stocks picking analysis, trading transactions, portfolio updates, and more related stuffs. Secondly, after some research on how I should track my portfolio, I came about using Investment Moat’s Free Online Investment Stock Portfolio Tracker Spreadsheet due to its transparency, simplicity and ability to personalize. But main reason, because it is free to use too. I will be using Google Docs Spreadsheet as recommended by most users and screenshot any new transactions that has taken place, but I will not be publicizing the document live for now (yet). So you all can see, my Forex account’s current value is down 70% but I believe this is just the start and that I still have a lot to learn (as well as lesson fees to pay). Greed, panic, fear are the main enemies I would have to conquer. And I know it takes time. However I believe that time is what I have in advantage compared to many, due to my desire to obtain my goal of financial independence in since young age. Hence I will definitely make full use of it. I am also thinking of topping up another $500 or even $1,000 in the next couple of months for me to upsize my position to conquer my emotions of fear as I currently risks only 5% of my account, in other words, $5-10. This means next to nothing when I lose them, which is not my point of trading Forex. Also, my hesitation to top up the account is not depleting another $500, it is how I should settle on a plan to effectively use it to teach me lessons that I am able to use in my trading journey in future- making sure that the $500 is a money well spent. For the investible cash capital, I have decided to split it into half. One half of it (~$4,000) on the BCIP application I had submitted last month and another half on nothing other than waiting for the best opportunity to appear (this cash is also informally known as the ‘war chest’ by some). The reason why I chose to use OCBC BCIP for my first ever equity investment is due to the simplicity, flexibility, reasonable commission fees. Simplicity of BCIP allows me to just submit an application to open the BCIP scheme and/or amend my monthly investment plan online since I already have an OCBC Savings Account with iBanking enabled. Plus seriously, what’s more simple that just the basic options to ‘buy, ‘sell’ and ‘amend’ your holdings? On top of that, BCIP does not require the hassle to open a CDP Account nor a trading account, saving me a bunch of time for documents to be signed, scanned and wait for. Flexibility of BCIP allows me to modify, add or remove any holdings anytime (although processed monthly) without any lock-in period, while having total rights to full dividends and capital growth without extra charges (at time of writing). It also allows the purchase of smaller numbers of shares with a chosen monthly investment amount (rounded to nearest hundred) instead of the standard lot size. Since my current job is temporary and I would not have a solid savings until I finish my NS+Further Studies, there is only this much of capital allocated towards my investment capital for the time being. 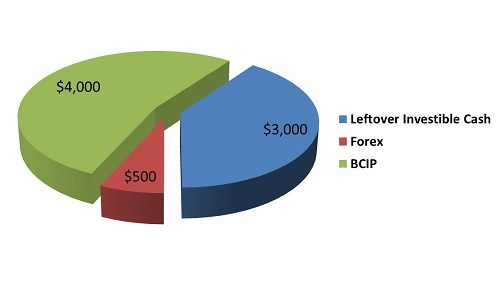 Additionally, I will be splitting up the $4,000 that I plan on investing with BCIP into half once again to at least allow my first investment to be ‘cost-averaged’ to some extent. Learning from my lessons from Forex trading, I have learnt to be disciplined to my trading system and rules regardless of situation (unless in extremely exceptional cases). This, especially, includes my emotions outlined above. This application order will most likely to be executed on 22nd of this month if everything goes well. And I do not lose out to any commission charges, by counter or by lot, as the 0.3% is a fixed rate regardless of lot size or counters. Even ETFs and equities are charged indifferently. At time of writing, I do not have any interest in selling the above stocks as the main purpose for investing on them is to gain experience in holding to a stock for long-term while collecting dividends as an income. Plus, I believe Singapore economy will be bumping up as a last wave for the next 3-5 years. I can think about closing my positions and preparing for the real war to come by then! Thanks for your encouragement. This write-up by my own and not a paid subject.